Need an Empty Bag for waste only? 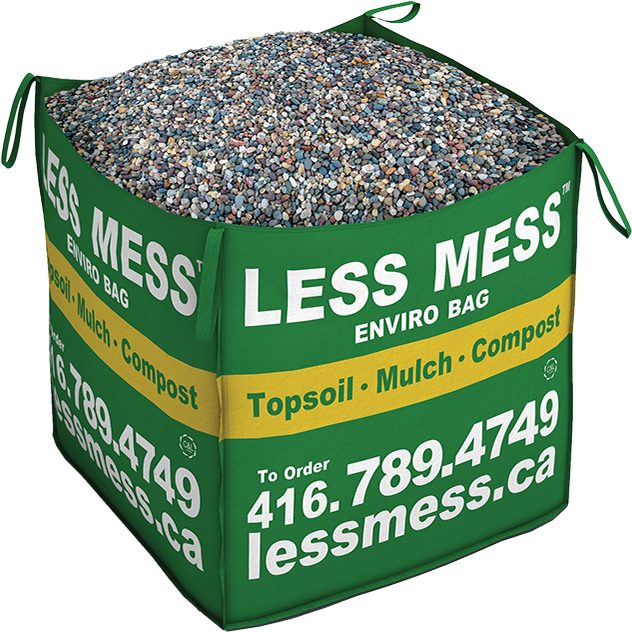 Empty Bags are available for pick-up and purchase at our head office for only $30 each. 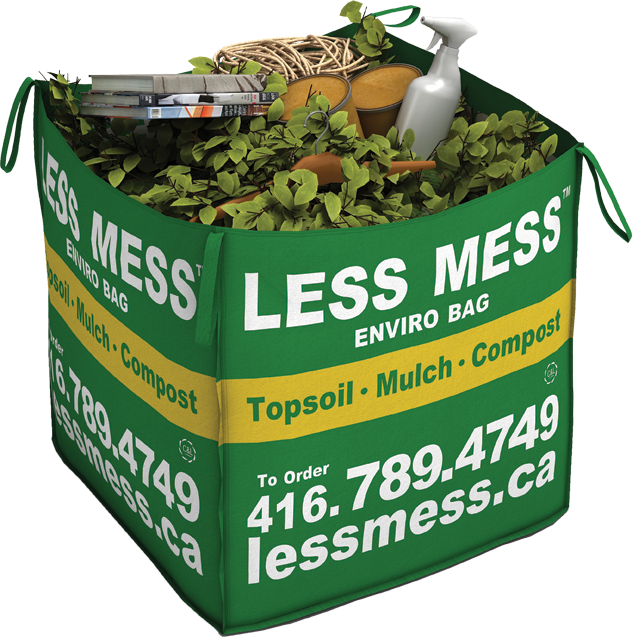 When ready, conveniently book your Waste Pick-Up Service here on our website OR by calling 416.789.4749. 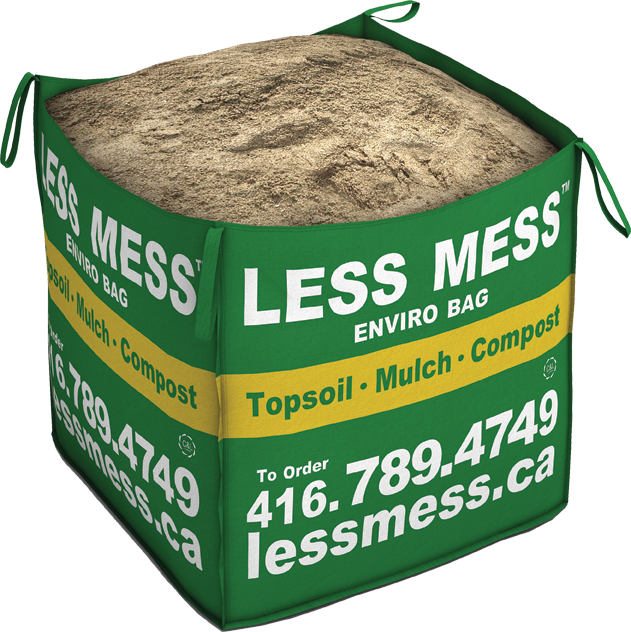 Our Premium Garden Blend bag of soil is composed of topsoil, compost (decomposed leaf, tree and shrub trimmings), peat loam and sand. This blend has our Premium Compost mixed into it which will help provide nutrients to your plants throughout the growing season. It is screened using the latest in screening technologies to ensure a uniform particle size. This garden soil is ideal for creating new gardens, reviving and replenishing existing garden beds, planting trees and shrubs, or planting flowers and vegetable gardens. 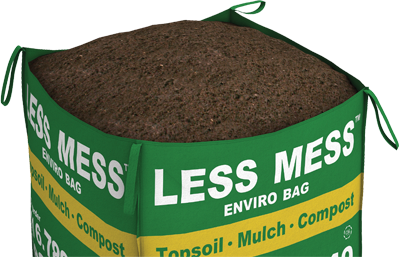 This is an all-purpose growing soil and can be used for most applications. Our Top Dressing Blend sack of soil is specifically designed for enhancing the overall appearance of your lawn. This mixture is comprised of peat loam, compost, topsoil and sand. It will help restore the look of your lawn and make your grass healthier and thicker than ever before. It is screened using the latest in screening technologies to ensure the blend will rake easily into your lawn. (See FAQ for more details on Top Dressing). This blend restores optimum health to your lawn by adding nutrients to help your lawn grow thicker. It is great for growing new lawns from sod or seed. This soil is formulated for maximal root growth. It contains a mix of compost, aged bark, peat, coconut coir and sand. It is pH balanced and designed to retain moisture in even the driest of weather conditions. This specialized soil blend includes a bag of fertilizer to be blended with the soil which supports seedlings from an early stage, giving them a boost right from the start (mixed in prior to shipping). This blend is the best way to start a vegetable garden. It contains coconut coir which helps to retain moisture in the soil. The aged bark in the soil will continue to provide nutrients as it decomposes, making this blend ideal for starting a vegetable garden or planting trees and shrubs. 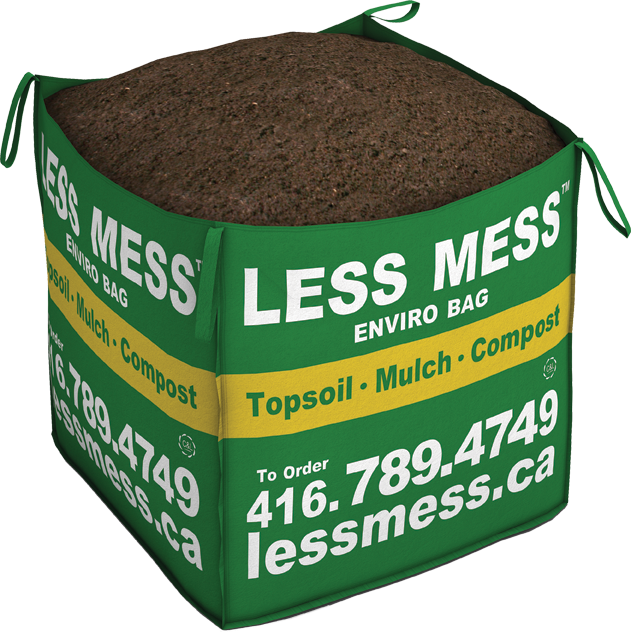 Our Premium Compost is comprised of organic matter including leaves, yard trimmings, and other vegetative matter. It is screened using the latest in screening technologies to ensure a uniform particle size and is dark brown to black in colour. Premium Compost is an excellent soil conditioner and amendment product that can be used for topping up and blending into soils for all gardens. The benefit of using compost in landscaping and gardening is the improvement of overall soil quality over time. Our Screened Mushroom Compost is the growing medium and by-product of the mushroom farming industry. 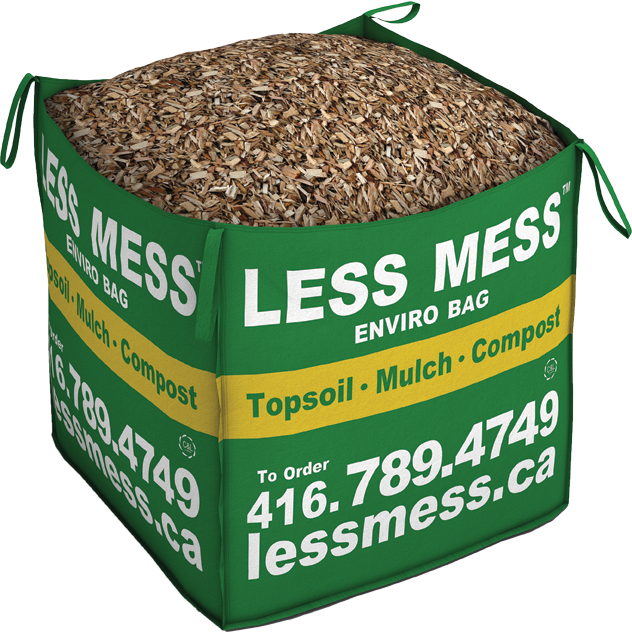 This specialty compost is processed through a fine screen to remove any large clumps and ensure an even particle size. Screened Mushroom Compost is primarily used as a soil conditioner in existing gardens, especially vegetable gardens. By applying as a topping to your existing garden, the compost will release nutrients into the soil over time. Our Cedar Mulch is made of freshly ground cedar tree bark. This mulch has a fine to medium texture, is fibrous and knits together very well. It has a distinctive natural cedar aroma and has a natural golden brown colour. 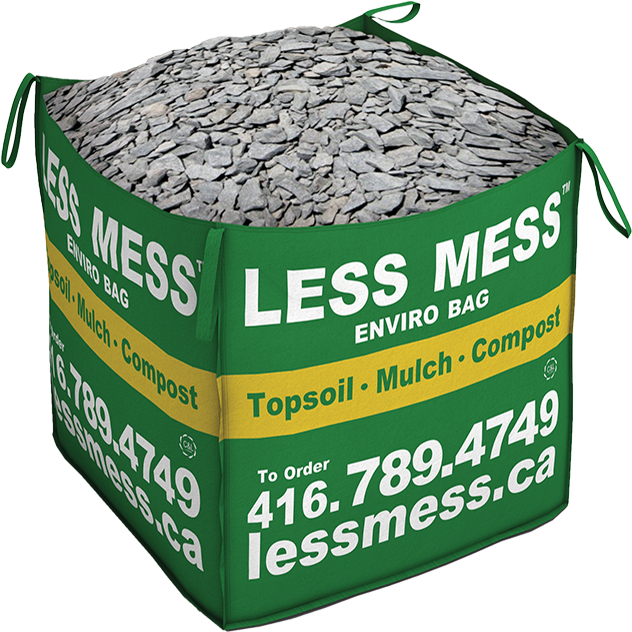 This mulch weathers well, is slow to decompose and lasts a long time. Over time, through decomposition and decay this mulch will age to a black colour and enrich the underlying soil. Cedar Mulch improves soil by adjusting pH levels (decomposed pine bark is acidic), improving fertility (more nutrients available to plants), and increasing organic matter. Cedar Mulch is used to help maintain moisture levels in soil beds by protecting the flowerbeds from direct sunlight. In hot temperatures, mulch helps keep plant roots cool and moist. In cold temperatures, mulch offers protection by acting as an insulator. For best results, apply at a minimum thickness of 4 inches in the spring. To protect your garden, apply Cedar Mulch at a thickness of 8 inches before snowfall in fall or winter. Our Shredded Pine Mulch is a blend of pine species with a touch of hemlock added to the mix. This mulch is aromatic and has a natural red/brown colour. It has a fine, shredded, uniform texture and knits together well. This mulch weathers well and lasts longer than most other bark mulches. Over time, through decomposition and decay, this mulch will age to a black colour and enrich the underlying soil. 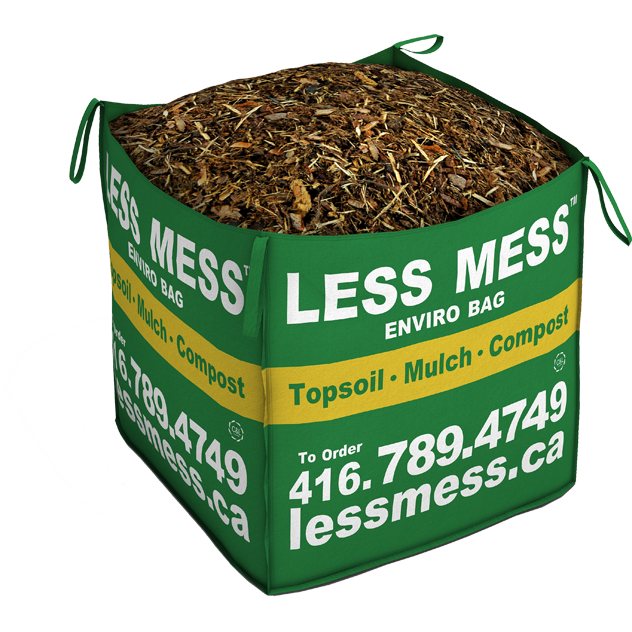 Shredded Pine Mulch improves soil by adjusting pH levels (decomposed pine bark is acidic), improving fertility (more nutrients available to plants), and increasing organic matter. Shredded Pine Mulch is used to help maintain moisture levels in soil beds by protecting the flowerbeds from direct sunlight. In hot temperatures, mulch helps keep plant roots cool and moist. In cold temperatures, mulch offers protection by acting as an insulator. For best results, apply at a minimum thickness of 4 inches in the spring. To protect your garden, apply it at thickness of 8 inches before snowfall in fall or winter. Our Bright Red Mulch is made of freshly ground cedar bark that has been dyed with natural iron oxides to beautify your garden. This mulch maintains its aromatic properties and knits together well. Over time, through decomposition and decay this mulch will enrich the underlying soil. 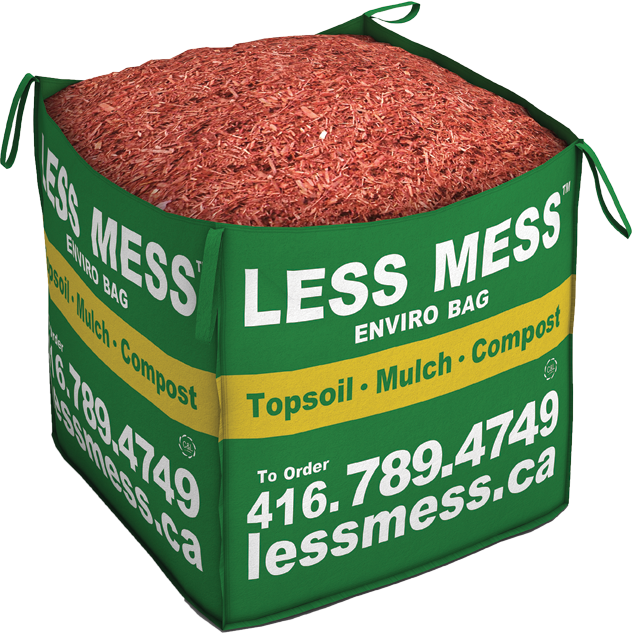 Bright Red Mulch improves soil by adjusting pH levels, improving fertility (more nutrients available to plants), and increasing organic matter. Bright Red Mulch is used to help maintain moisture levels in soils by protecting the flowerbeds from direct sunlight. In hot temperatures, mulch helps keep plant roots cool and moist. In cold temperatures, mulch offers protection by acting as an insulator. For best results, apply at a minimum thickness of 4 inches. Apply annually to refresh the bright red colour and beautify your garden. Our Black Bark Mulch is a blend of hardwood substrates that has been dyed with natural iron oxides. This mulch is aromatic and has a deep black colour. It has a fine, shredded, uniform texture and knits together well. Over time, through decomposition and decay this mulch will enrich the underlying soil. 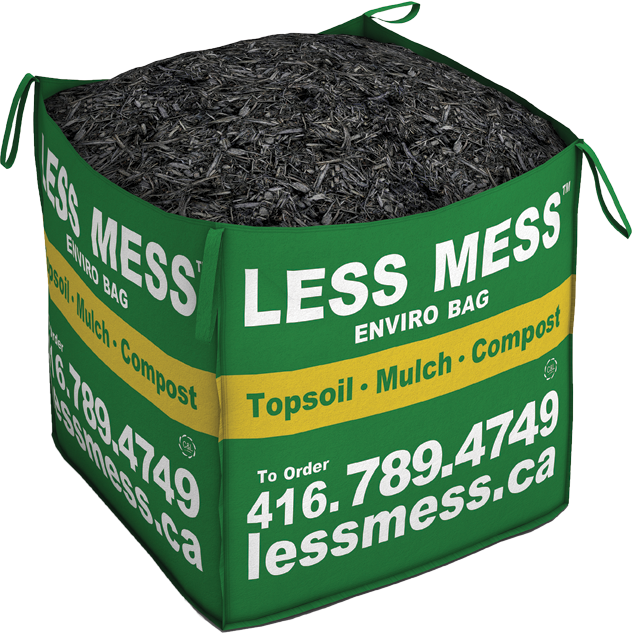 Black Bark Mulch improves soil by adjusting pH levels, improving fertility (more nutrients available to plants), and increasing organic matter. Black Bark Mulch is used to help maintain moisture levels in soils by protecting the flower beds from direct sunlight. In hot temperatures, mulch helps keep plant roots cool and moist. In cold temperatures, mulch offers protection by acting as an insulator. For best results, apply at a minimum thickness of 4 inches. Apply annually to refresh the deep black colour and beautify your garden. Playground Chip is an impact absorbing, recreational surfacing product comprised of 100% natural wood fiber. Virgin wood fibers are processed through a special grinding, screening and blending system that produces a clean, uniform chip. Playground Chip is ideal for recreational surfaces. These include parks and children’s play areas as well as high traffic areas like trails and walkways. River Stone is a decorative, 2-5 inch stone used extensively in landscaping applications, along riverbeds and in shore protection along rivers. This multi-colour stone is used around ponds, waterfalls, garden borders or other landscape accents. This sand is washed and free of all debris, including clay and silt. The sand’s grain is large enough that it will not blow away in light winds. This sand is ideal for sandboxes, interlocking, and other landscaping requirements. HPB – High Performance Bedding, is a base material that can replace the need for the bedding layer and the base layer of material under pavers. It consists of a 3/8” washed limestone chip. It is an alternative to screenings as a base material that does not need compaction. It is typically used as a grading base under patio materials. It is also the preferred material for building pathways. A crushed limestone product. It is made up of chips (1/4”) mixed with dust. High quality, 3/8 inch (10 mm), natural, round stone Ideal for decorative landscaping or repairing a flat roof. It is used around patios, decks, gardens, play areas, pathways, dog-runs, pools and ponds. A ¾” Clear is a crushed washed limestone. Used for drainage around weeping tile, as well as for decorative ground cover. This is the most convenient service we offer. 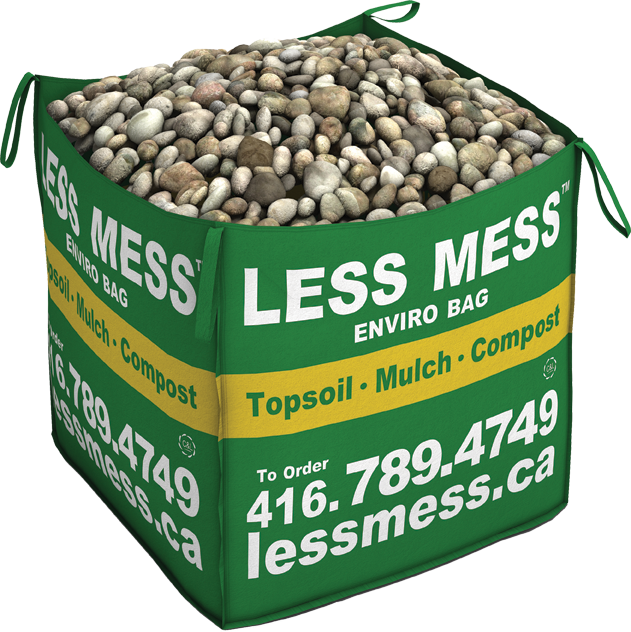 Simply fill your empty Less Mess bag with non-hazardous household or garden waste and we will come pick it up. If you've already purchased the waste pick-up service and you would like to schedule a pick-up, please log in to your account to start the scheduling process.